Adobe announced today that its Flash Player 9 is being updated to add support for the H.264 video standard and High Efficiency AAC (HE-AAC) audio, plus full screen video playback with hardware acceleration, and multi-core enhanced vector rendering. The public beta version of the Adobe Flash Player 9 update, code-named "Moviestar," is available immediately as a free download from Adobe Labs. The final release is expected to be available via update in the fall. 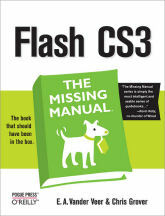 This was an obvious need for Flash, as it has expanded from Web-based video to mobile phones and other portable devices. 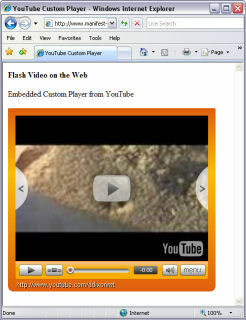 Supporting H.264 directly in Flash now allows the same video content to be played from desktop computers to mobile devices across the Internet. As suggested on Adobe developer Tinic Uro's blog, this update was not just obvious, it was so much in demand by customers that Adobe could not hold it for the next revision in its typical development cycle. See Uro's blog for more technical details. His bottom line: You should now be able to play H.264 files directly in Flash (i.e., from iTunes and Mobile phones, including .mp4, .m4v, .m4a, .mov and .3gp). Note that this is only the updated H.264 version of MPEG-4 (also known as Advanced Video Codec, AVC); the earlier MPEG-4 Part 2 is not supported. 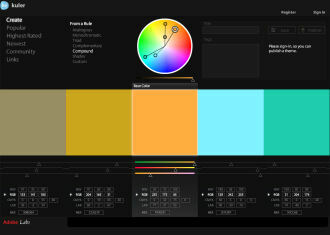 Create harmonious color themes based on predefined color formulas, or by mixing your own color themes using an interactive color wheel in a variety of color spaces. View popular, top rated, and newest themes, or seach the on-line collection. Register free for an Adobe ID to tag, comment, and share themes. Web developers can directly copy/paste hex values. 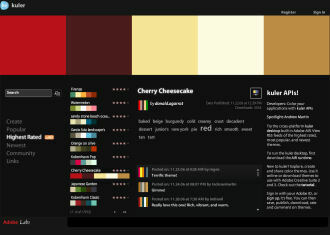 And users of the Creative Suite 3 and 2 family of software can download kuler color themes as an Adobe Swatch Exchange file (.ASE). kuler is implemented as a web-hosted application from Adobe Labs, built using Adobe Flash and ActionScript 3.0. Subscribe to RSS feeds of the popular, highest rated and newest color themes, or use an Apple Dashboard widget to subscribe to these feeds. In addition, Adobe has opened the kuler APIs though its Adobe Labs site, so you can develop an application or website colored by kuler. Or try the cross-platform kuler desktop, using the Adobe Integrated Runtime (AIR). Are you sharing your videos online? Each day, on YouTube alone, visitors view hundreds of millions of videos and upload hundreds of thousands of videos. See my article -- Sharing Videos on YouTube -- for details on how to upload to YouTube, embed clips in your own website, and then go further to customize your videos and how they are presented. It's hard to imagine in this world of online video, but YouTube was founded only three years ago in February 2005. The power of this idea of user-generated content (UGC) then was validated when Google purchased YouTube in November 2006 for $1.65 billion in stock. If you'd like to share your videos with the world -- or even with friends and family -- YouTube makes it amazingly easy to upload your clips for visitors to view, and for free. 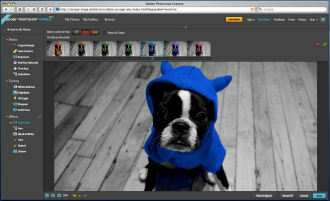 The latest versions of consumer video editing tools also have built-in Web uploading. For example, CyberLink PowerDirector 6 uploads to YouTube and Pinnacle Studio 11 publishes directly to Yahoo! Video. Once you've uploaded your clips, you can send visitors to YouTube to play them, or embed them within pages on your own website or blog. But there's more you can do with YouTube, including customizing the look of the player, and restricting clips for private viewing by a specific list of contacts. While these video sites are a great way to get started, you do give up ownership of your clip and control over how it is presented (for example, YouTube uses an older version of Adobe Flash video compression, so the video quality is not as good as it could be). Instead, you can prepare and host your clips under your control -- compress them for better quality, and design your own web pages with a Flash video player using tools like Adobe Dreamweaver CS3. The YouTube / Google Help Center has good explanations of setting up and using YouTube. See full article for more details -- Sharing Videos on YouTube. My strongest take-away from the Streaming Media East 2008 show last week is that video is really taking off on the Internet. I know ... that's a "D'oh!" kind of statement -- but bear with me. "Google Sites once again ranked as the top U.S. video property with more than 4.3 billion videos viewed (38 percent share of all videos), gaining 2.6 share points versus the previous month. YouTube.com accounted for 98 percent of all videos viewed at Google Sites. Fox Interactive Media ranked second with 477 million videos (4.2 percent), followed by Yahoo! Sites with 328 million (2.9 percent) and Viacom Digital with 249 million (2.2 percent)." The average online video duration was 2.8 minutes. But this online video thing is not just about stupid viral videos and stolen clips on YouTube, this is a mass migration of entertainment content becoming available on the Web. Content companies are opening their vaults to provide free (ad-supported) access to movies and TV shows online. According to Nielson, the recent Hulu joint venture between NBC Universal and News Corp. has quickly grown to be the top network site. Hulu includes material from more than 50 top broadcast networks, cable networks, movie studios and web-centric content providers. And CBS.com is now offering a "couple hundred" shows, deep into its archives. Social media sites are also exploding -- As of January, Akamai was delivering more than 1 million requests per second for social media sites. And comScore's March report saw 47.7 million viewers watching 400 million videos on MySpace alone (8.4 videos per viewer). Finally, beyond all this consumer excitement, CDN (Content Delivery Network) companies I spoke to at the show also see expanding use of video in non-entertainment and corporate sites -- as an important part of a web presence. All of which will continue to drive growing demand for video bandwith. And it's not just low-res "web" video -- A recent survey from Akamai and Broadband Directions reports that nearly 75 percent of leading broadcasters said they have plans to offer high-definition video content to their online audiences, half within the next 12 months. Says Tim Napoleon, chief strategist, Media & Entertainment, at Akamai: "Even six months ago, a 500 or 700 kbps bitrate was pushing it. Now while 500-700 kbps is more of the norm, we're seeing companies really pushing the envelope with 1.5 to 2 Mbps and HD, in the ranges of up to 6 megabits per second bitrates." Or as Homer would say, "Woohoo!" See the StreamingMedia.com site for show coverage and podcasts. NBC is piling on the online programming from the Beijing 2008 Olympics, August 8-24 -- planning to offer over 3600 hours on its NBCOlympics.com site, and free (with 30-second pre-roll commercials). NBC reports that the site had 70 million page views last Friday, 10 times more than the 7 million views on the opening day of the Athens Games. The NBCOlympics.com site offers news, photos, and videos from the 34 medal sports, searchable by sport, country, athlete name, type (live, highlights, etc. ), and relevance (see the Site Map for a complete listing). 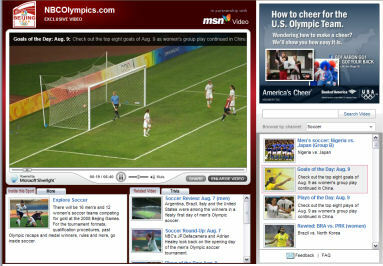 The NBC Olympics Video section includes live feeds, replays of broadcast shows, highlights, special features and interviews, and local interest. And there's lots of ways to see the videos -- watch a streaming video, watch higher res video or even four events at a time, watch low-res video on a mobile phone, or download a highlight clip or entire event to watch later. To display the videos, NBC is using the Microsoft Silverlight video technology -- Microsoft's answer to Adobe Flash for platform-independent Web (and desktop) video playback. Silverlight runs on Windows and Macintosh (Intel only), under recent versions of Internet Explorer, Firefox, and/or Safari. It does require installing the latest update -- Silverlight 2 beta 2. Although the Olympics is an international event, NBC has the rights to broadcast on the Internet only for the U.S. & Territories (excluding Puerto Rico). So when you click to play an event video, the site prompts you for your zip code and TV provider / local broadcaster. As a result, the site can nicely display event information using local times (and dates), and offers video from your local station, including local athletes and related blogs. The official site of the Beijing 2008 Olympic Games also provides information and results in multiple languages, and photo galleries. Jan Ozer certainly knows how to flog a topic to death! If you want to know about producing video for streaming, and especially understand the trade-offs in using streaming codecs, then Ozer has done an amazing amount of work to get it all figured out and then organizing the info to help the rest of us -- which he has kindly made available in his magazine articles, conference talks, and in a new mixed-media DVD tutorial. If you want to know more, definitely head off to the Streaming Media West conference coming to San Jose on September 23 - 25, 2008, and make sure you see Ozer's sessions on Encoding H.264 Video for Streaming (Mon. 9/22) and Producing H.264 Video for Streaming (Wed. 9/24) -- (see previous post on his Streaming Media East presentation). But to get the full story, you need Ozer's new mixed-media DVDs on Critical Skills for Streaming Producers ($249), with additional editions focused on Critical Skills for Adobe Creative Suite 3 and Critical Skills for Apple Final Cut Studio ($99 each). - Extensive comparisons of the key streaming codecs (MPEG-4 / H.264 for QuickTime and Flash, On2 VP6 for Flash, Microsoft Windows Media Video WMV/VC-1) -- including rating quality and collecting 70+ examples of encoded videos, for both standard definition and high-def. - Encoding tutorials with screencam videos of Adobe Media Encoder and Apple Compressor demonstrating encoding for Premiere Pro and Final Cut Pro. - Extensive analysis of major broadcast and corporate streaming websites to research how they are actually using streaming video, including detailing information including video resolutions, frame rates, and data rates. But that's not all -- besides the advice and information on choosing and tuning the streaming codec, the book also includes multiple chapters on the production process and workflow, with advice on designing the set, lighting, shooting, and editing for streaming delivery. Yeesh! Web video can be stupid pet stunts shot in jerky camera phone video and playing in a tiny window . Or it can be much more, using the compelling power of video to connect with viewers to tell a story -- or send a message about your company or yourself. Web Video: Making It Great, Getting It Noticed draws on Jennie Bourne's background in TV news production and editing to focus on bringing the power of well-produced video to the Web. The first part of the book focuses on shooting high-quality video that will look good when it's shown on the web, with details about camera and audio settings, and shooting in specific environments like events and interviews. Bourne then discusses two specific video styles: video blogs with your personal syle, and TV-style productions for storytelling. Once you're done shooting, the next sections get your raw material to the Web: editing to convey your message, with advice on techniques for tighter editing and better storytelling, and then compressing and uploading to the Web, with information Web video hosting sites and choosing the best video formats and compression settings. The final sections reaping the benefits of your work, with advice on getting your video noticed though networking and promotion to drive traffic, and then making it pay, though advertizing and by promoting yourself and your skills. 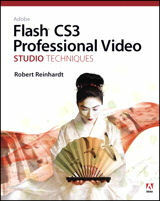 The chapters also include interesting interviews with Web video pioneers and suggested projects to get you started. The book ends with the two final projects that sum up Bourne's message: Identify and Target Your Audience -- and then Network! 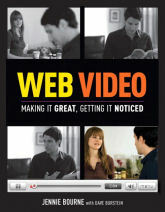 So if you have something you want to say, and the creative urge to say it in video, then this book can help you do a better job -- first, by shooting a higher-quality video production designed for Web playback, and then by using the Web more effectively as a platform to spread your message. See Jennie Bourne's WebVideoBook.tv companion site for sample footage, extended interviews, reviews, and tips for making better video. See Peachpit for more information, including access through an electronic subscription at Safari Books Online. Adobe Dreamweaver CS4 shipped in October 2008, with deeper support for developing advanced websites. 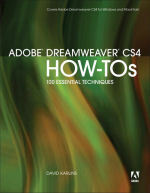 Dreamweaver CS4 is easier to use, having adopted the Adobe interface design, especially for customizing your workspace. For editing individual pages, the new Live View mode lets you design pages in the fully-rendered browser view, and simultaneously view and update the underlying raw HTML. You also can directly access related files including linked CSS styles, with assists for creating styles with CSS best practices. If you're familiar with Web design, and interested in learning Dreamweaver CS4, check out Adobe Dreamweaver CS4 How-Tos: 100 Essential Techniques. This book is not for novices; it does not spend time on basic Web design (HTML and CSS), or on explaining the general Adobe user interface. Instead the first chapter skips basic page design to dive right in to the logistics of managing an entire website of files, and updating them to a remote site. The first half of the book then steps through important techniques in building pages, including tables, divs, text, images, style sheets, and templates and libraries shared across the site. Each of these 100 techniques explains the idea, steps through the operation (with screen shots), and includes additional tips. Adobe Dreamweaver CS4 How-Tos is targeted to an intermediate audience, with enough Web experience to understand how to apply these various techniques in a larger project, and enough experience with earlier versions of Dreamweaver or similar products to be able to dive in to the instructions. For example, chapter 5 dives into Dreamweaver's Absolute Placement Objects / divs, and then only later discusses CSS divs -- there's no general introductory context explaining these, or why it's useful to use divs for page layout. The 100 Essential Techniques are exactly that, clear explanations of how to perform important page and site design functions with Dreamweaver, from basic formatting to more advanced interactivity. Internet radio services like Slacker and Pandora extend traditional broadcast radio in two ways: with customized channels and with enhanced playback (see previous post). You not only can choose from a wide range of pre-programmed "channels" with a wide variety of genres, but you also can customize your own personal channels with specific artists, as well as have these services help you discover new music that fits the style of your favorites. Playback on a computer also provides the ability to better enjoy the music. You have more control -- you can pause and continue later, and skip forward to the next track. And you have more information -- including the playlist and upcoming track, artist and album reviews, and lists of related artists. Slacker has just taken this idea further by adding song lyrics, so you can read (and even sing) along with the music. The free add-supported Slacker Basic Radio service displays a few lines of lyrics, but this is designed as an incentive to upgrade to the Slacker Radio Plus service ($47.88 annual subscription, or $3.99 per month). The Plus service adds the full song lyrics from LyricFind, unlimited skips, unlimited song requests, and ad-free listening. And Internet radio has gone mobile -- Slacker and the Plus service with lyrics also is available on laptops, BlackBerry and iPhone, Sony BRAVIA TV, and the Slacker G2 portable player (see previous post). As the record labels struggle with the digital revolution, these kinds of services offer an easy way to extend broadcast radio to explore and discover a wide range of music, and enjoy learning more about the artists and the music. See my Portable Media Players Gallery for more on music and media players. Jan Ozer is a regular presenter at the Streaming Media East conference (see previous posts). This year he kicked off the week with a half-day seminar on Encoding H.264 Video for Streaming and Progressive Download, following up on his presentation last year on Comparing Video Codecs (see 2008 post), as also covered in his book on Critical Skills for Streaming Producers (see previous post). Then Ozer had some fun with his conference session on Tuesday, with a session of sage advice on Improving Your Video Quality for Streaming Production. His bottom line is that video "should look as good as photos shot with a still camera." With today's progressive video cameras and good production values you should be able to shoot great-looking video that compresses well and still looks good after streaming. This requires paying attention to what you are shooting, paying attention to the compression process, and working though the whole process -- including previewing the compression -- to make sure it all looks good. UPDATE: The presentations from the conference sessions and workshops are posted at www.streamingmedia.com/east. And many of the videos from the conference and associated Content Delivery Summit are now available at www.streamingmedia.com/videos. Download Ozer's presentation on Video Quality for Streaming Production (PDF). So what is Google Docs? It's free online storage for your office files (documents, spreadsheets, presentations). Plus online editing of office documents, with no desktop application required. So you don't have to carry your files with you, or sync them between different computers -- you can store and organize and edit and share them, all from the online cloud (though there are some limitations depending on the file formats). You can share your documents with others, by invitation or through authorized Google Accounts. You even can collaboratively edit documents with multiple people. And there's more -- Google Docs is also a great way to share your existing files (and collections of documents) without needing to convert them to HTML or manage multiple versions in different formats. You can Publish documents to a webpage, and Google Docs converts your file to formatted HTML, and returns a custom URL to the page. You then can share the link privately by e-mail, or post it on the web for anyone to access. To build your online collection of files, you can upload (and download) files in a variety of formats, including documents (Word, OpenOffice, RTF, HTML text), spreadsheets (xls, .csv, .txt and .ods), and presentations (.ppt and .pps). And you can export to PDF and HTML. Or upload documents by e-mail by sending to a custom e-mail address -- as the body of the message or with attachments. Google Docs is part of the Google Apps suite of Web services, including Gmail, Google Talk, and Google Calendar, and works with the single Google Account login. Of course, for Web communicators, Google Docs is also great for linking documents from your posts on Google's Blogger service -- for free, simple, but customizable blogs. The WebAround is a simple idea, nicely realized, to help you make better-looking, more professional webcam videos. The problem with shooting informal Web videos is that it's just not very classy to shoot clips that show the clutter of your office (much less your home) behind you -- and it also lowers the quality of your video by wasting compression on the details in the background. Instead, you can present a much nicer look by positioning a clean backdrop behind you. But it's a pain to set up and break down a backdrop in a cramped and temporary space, or to try to hang and drape cloths around. 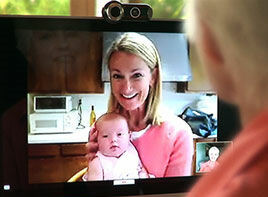 Instead, the WebAround is a flexible, collapsible, portable webcam backdrop. It's made from a light-weight nylon material, opens to a circle 40 inches in diameter, and -- here's the best part -- it has an adjustable strap to stand it up by slipping it over the back of a chair. Just set it up, sit down, and you're shooting in your own personal studio. This also gives you some privacy when you're working in an open space. When you're done, the WebAround folds up to around 15 inches. You can clean it with a damp rag, and use a streamer or iron to remove wrinkles. The WebAround is available for $29.95 in green, gray, or blue, and comes with a 30 day money back guarantee. You can also order it with custom designs or logos. There's also a new reversible green screen / blue screen version with a surface designed for chroma-key work. Logitech has an extensive line of QuickCam Webcams for notebooks and desktop use, ranging from around $29 to $129, some with built-in mics, high-quality glass lenses, autofocus, and even motorized tracking. These are compatible with video instant messaging and calling applications like Windows Live Messenger, AIM, Yahoo! Messenger, and Skype. And Logitech includes several QuickCam software applications for capturing photos and sending video e-mail, options to enhance the video and audio quality, plus Video Effects to overlay fun face masks and decorations and apply photographic-style filters. 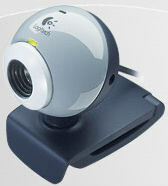 The result is today's introduction of Logitech Vid, simple video conferencing software for PC or Mac. Vid has a simple setup, which uses e-mail addresses to identify you and your contacts. It automatically finds your webcam, mic, and speakers, although you can change them in the settings dialog. (It also automatically reduces background noise and performs echo cancellation.) There's also a handy Practice Call option on the main screen to record a brief clip to test your equipment. The main screen then shows thumbnail photos of your friends, so you can just click to start a video chat. Again, there aren't a lot of confusing options -- just mute, full-screen display, and picture-in-picture to show your local camera view. It also works fine without a camera for audio chats. You can leave Vid running in the background to show other users that you are available, and respond to calls. The video is good quality, VGA 640 x 480 resolution, at full 30 frames per second. It's designed to run over a 768 Kbps connection (receive and send), but will run down to a minimum of 256 Kbps. Vid is compatible with SightSpeed and Dell Video Chat, but does not work with the various instant messaging and calling applications -- although you still can run them on the same machine. 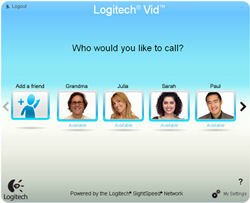 Logitech is making Vid available as a free download for users with Logitech webcams. You also can send e-mail invitations to friends to download the software for free and connect with you, no matter what kind of webcam they are using. Otherwise, if you don't have a Logitech webcam and have not received an invite, you still can use Vid on a 30-day trial basis. You can't by the software by itself, but you can get a Logitech webcam (starting at $29) to authorize the software -- or find an old model. If you're interested in getting a webcam and using software like Logitech Vid to chat with friends and family (see previous post), then Logitech has a nice selection to choose from. The Logitech QuickCam webcam line starts at $29, with cameras that can sit on a desk or clamp onto monitors, and notebook cameras designed for travel. Then step up to higher-res sensors, higher-quality glass lenses, RightLight 2 technology for dimly lit scenes or poor backlight, Carl Zeiss Optics, and autofocus. The QuickCam Orbit AF ($129) even has motorized tracking to follow as you move around the room. Logitech also bundles a variety of software with the higher-end camera, including Logitech Video Effects, Fun Filters, Intelligent Face Tracking, HP Photosmart Essential (to capture, edit, and print images), and video chat and conferencing software (Windows Live Messenger, Skype, Yahoo Messenger, AOL Instant Messenger). Interestingly, in this age of rapid product innovation and turn-over, Logitech's webcams have amazing longevity -- the QuickCam Pros and QuickCam for Notebooks were intorduced in 2007, and the QuickCam Connect in 2006. Even more amazing, Logitech has been able to hold the price points on these products (which were aggressively priced to begin with). Meanwhile, Logitech has upgraded its software and added new applications like the Vid video conferencing -- check the support area on the website for QuickCam software updates. Companies continuously struggle to understand their customers and deliver products to the market. Marketing, according to the American Marketing Association, is the activity, set of institutions, and processes for creating, communicating, delivering, and exchanging offerings that have value for customers, clients, partners, and society at large. This is what companies are supposed to be doing with their products. In olden days, buyers and sellers would congregate face-to-face in the market square by the castle walls. But in our modern world, getting products like music CDs to customers requires difficult logistics to first estimate sales volumes, and then ship from factory to distribution centers to independent retailers, with the hope that the stores will display and promote the discs in sync with the national advertizing campaign. Then, at the turn of the millennium came the dawn of digital distribution, and the original Napster. This should have been a marketeer's dream, the ultimate gift to the recording industry from music fans -- A pre-built electronic market square, created by a self-organized group of enthusiastic consumers, coming together to communicate, deliver, and exchange, based on their love of music (and incidentally providing detailed information about their interests). But instead of taking advantage of the opportunity, the recording industry chopped up Napster with lawsuits, only to see new versions of sharing services regrow, hydra-like, which then needed to be cauterized with even more lawsuits, ad infinitum. To push the metaphor, instead of building on Napster to promote music and nurture digital distribution, the recording industry redefined its role into an endless Labours of Hercules, suing not only its impassioned customers (and grandmothers in the line of fire), but also visionary entrepreneurs who wanted to grow new businesses around music. The result, of course, was to allow Apple innovate its way into dominating digital music with the Apple iTunes store, making a very nice business out of selling inexpensive music (and video) to promote its quite profitable sales of iPods and now iPhones. And now the latest data from The NPD Group shows that Apple has increased its strength, not just in digital music, but in the entire retail music category -- iTunes has 25% of the U.S. retail music market, with Walmart second at 14% and Best Buy third (in music units sold). Apple's share has grown from 14% in 2007 and 21% in 2008. For the moment, CDs remain the most popular format for paid music purchases with 65% of all music sold in the first half of 2009, compared to 35% for paid digital downloads, which has grown from 20% in 2007 and 30% in 2008. But NPD predicts that digital music sales will nearly equal CD sales by the end of 2010. That's what happens when you look a gift horse in the mouth -- and then reject it. Instead of managing the market by working with the original Napster, the recording industry handed the reins to Apple. That horse has left the barn. Media player software continues to expand its scope -- from playback of local files to streaming media and CD and DVD, to acquisition with audio CD ripping, to sharing with CD burning. And now RealNetworks has taken the next step with the release of a the eleventh edition of its media player, now called RealPlayer SP. RealPlayer SP is for our YouTube and Twitter world. The "SP" stands for "Social" and "Portable," and the new RealPlayer now grabs and downloads video clips from Internet sites like YouTube, converts to a variety of file formats for portable and home devices, transfers clips to your iTunes library, copies directly to attached portable devices including media players and cell phones, and shares online to Facebook and Twitter. The basic player is a free download, and there's also a RealPlayer SP Plus version for $39.99, with support for DVD playback and burning, plus higher quality H.264 video conversion for other devices like the Sony PlayStation 3 and PSP. RealPlayer SP starts as a universal media player and organizer that supports the major media formats (including Flash, QuickTime MPEG-4, Windows Media, DVDs and CDs). It also can acquire new media by ripping CDs and, in the Plus version, by recording vinyl and tapes and voice. However, the organizer does not have the range of options for visually exploring your media and cover art as found in other players, such as Album / Artist in Windows Media Player and Cover Flow in QuickTime Player. Plus RealPlayer SP is a streaming Internet player, designed as an integrated player and browser, so you can access and play online clips through RealGuide, Internet radio, and the RealNetworks subscription services. The LivePause and Perfect Play features allow you to pause, rewind, and fast-forward through live audio or video clips while they play, providing instant replays. And now RealPlayer SP adds the ability to download video from the Web. Downloading is very easy: Just browse video sites as usual in your regular browser, and you'll see a new Download This Video button above the video window. Click to start downloading (including multiple files at once), and then choose to convert formats, copy to portable devices, or share online. Or use the separate RealPlayer SP Converter application to convert multiple files to multiple formats, using a built-in list of devices and formats, or customize your own. However, RealPlayer is burdened by a second purpose: promoting the RealNetworks stable of subscription services and download stores. To support all this, the RealPlayer interface is browser-based, so you never know what will happen when you click. Four of the seven main tabs at the top of the main window are for these services -- three tabs display player information (My Library, Now Playing), while the four others jump to websites. And unlike the on-line guides in other player applications, which are focused on immediately playable content, the options in Real Guide again link to even more Real sites. To add to the confusion, while some of these sites at least are obviously identified as Real properties (e.g., Rhapsody, RealArcade, Real Mobile), others avoid the affiliation even if you are looking for it (e.g., GameHouse, Film.com, Rolling Stone). The main Real Guide site also is festooned with ads. Clicking within these sites is additional exercise in the unexpected -- you may go to another website, or start a clip playing in another tab, or have your entire context disappear into a full-screen video advertisement, or cause a new pop-up RealPlayer browser window, or even pop up a external window in Internet Explorer. But once you understand this dual purpose, RealPlayer SP makes sense as a media player, plus as a gateway to other Real services. But it's the download / convert / copy / share features that make it stand out. This is about as easy as it can get, not for only cleanly grabbing online videos, but for solving the entire problem -- getting clips where you want them, in the right format, and even transferred directly to a portable device. Do you want to shoot or encode streaming media for the Web, to view on computers, or on mobile devices including the iPhone and iPad? Then your go-to guy is Jan Ozer, who has been shooting, editing, and delivering video for decades -- and freely sharing his expertise in books and a wide variety of magazines (see Wikipedia bio). Jan was back at the Streaming Media East Conference in New York earlier this month, presenting workshops on both Video Production and on Encoding H.264 Video for web streaming (see post from last year). As usual, the conference organizers have posted these and other workshop and presentation notes on the website. Ozer also has developed his own Streaming Learning Center website and blog, with industry updates and his trademark authoritative articles with technical analysis and comparisons of video tools and compression codecs. An extensive survey of key issues in the production workflow for preparing streaming video, spanning Production (setup, lighting, shooting), Editing (particularly correct use of aspect radio and de-interlacing), and Encoding (with codec comparisons and recommended settings). As usual, Jan provides useful, practical advice, with lots of specifics (100-some slides) illustrated with example screen shots of dos and don'ts. Lots of information and advice on H.264 encoding parameters, with specifics on producing for computer, iTunes, iPhone and iPad. Plus a bonus section on comparing codecs, with extensive examples with different encoding options. Again, check Ozer's Streaming Learning Center site for deeper articles on these and related topics. And don't miss his presentations at the Streaming Media conferences. The streaming media market can be heinously confusing when you're trying to evaluate all the different options, from core video technologies to streaming service providers. But there aren't many markets whose customers are better served than by a flagship publication (and website and associated conferences) like Streaming Media.com, and by prolific and accessible experts like Jan Ozer on video technology, techniques, and tools (see previous post), and Dan Rayburn on the business and market of streaming media. Rayburn is EVP for StreamingMedia.com, and again was the conference chairman for the recent Streaming Media Conference, with over 100 speakers in 30 sessions, and 50 exhibitors (see his personal DanRayburn.com site). And there's more -- Rayburn not only keeps his fingers on the pulse of the streaming media market, he openly shares this information to help make the market much less opaque. This is the kind of material that you often can only find in expensive analyst reports in other market areas, but Rayburn instead has been reporting for years on areas including market metrics and size, companies and segmentation, and even pricing for different classes of services. Again this year, Rayburn presented his session on CDN Data: Pricing, Contract, Volume and Market Sizing Trends at the Streaming Media East conference (see presentation PDF). This summarized Content Delivery Network market growth and pricing, along with his analysis of developing trends driving the industry (see post on last year's presentation). Rayburn reports that 2010 looks to be a good year for CDN growth, based on stronger demand and less aggressive price drops from last year (the low-cost leader strategy has not been sustainable in this market). CDNs also are branching out into more value add services beyond commodity bit-pushing, including acceleration, security, and verticals. Finally, Rayburn sees a bigger surge in the market more like 24 months out, driven particularly by focusing on application acceleration for specific needs. He is less enthusiastic about seeing big impacts from other hot trends including HD video, video advertizing, live events, and cloud computing. You can follow Rayburn and get more detailed information on his Business of Video blog (hosted on the Streaming Media site). UPDATE: The StreamingMedia.com team has launched a new site, OnlineVideo.net, which is designed to be "StreamingMedia for the rest of us” -- with how-to articles, case studies, buyer's guides, reviews, and more, targeted for those who are starting out, intermediate, and advanced. The Streaming Media East conference is back in New York this week, with some 60 exhibitors and the conference program featuring some 120 speakers in 36 programs (see post from last year). Special features this year include a conference track on HTML5, and a broadband-enabled device exhibit pavilion with hardware devices and platforms from Netflix, HBO, Hulu, Apple, VUDU, Microsoft, Sony, Blockbuster, Amazon, Google TV, MLB.TV, ESPN, NBA and others. A welcome highlight of the show is the return of Jan Ozer of Doceo Publishing, presenting seminars on encoding video for HTML5, Flash, Apple iOS and other mobile devices, and using adaptive streaming. These were certainly hot topics at the conference, with the promise of embedded video support in HTML5 being fractured by the limitations of specific browsers, Adobe's move to leverage HTML5 to enable Flash-based sites to play even on the iPod and iPad, and the power of adaptive streaming to present a consistent stream by dynamically switching between multiple versions of a file at different bitrates. For more on these topics, check out Ozer's StreamingLearningCenter.com site, with a wealth of information, including his articles from Streaming Media and EventDV magazines. Jan is a digital video expert who walks the walk as an active shooter and producer who is wonderfully open in sharing his expertise. Ozer's trademark approach goes beyond technology explanations and product reviews to provide specific advice from his real-world experience. Then he goes further by publishing the results of performance and quality tests, and analysis of how popular sites are using streaming video. His site also includes video tutorials, sample comparison images and videos, and information on his webinars, seminars, and consulting. The Streaming Media East conference has wrapped in New York. The buzzwords at the exhibition and presentations were similar to last year -- content management, mobile, playback on any device, live streaming -- but with even more emphasis on integrated offerings, going beyond generic storage and delivery to offer value added services, customization of offerings, integration with outside services (as in educational applications), and better reporting of what the users are doing. As a microcosm of this extension of streaming media beyond just playing video, a new theme at the show was the revitalization of digital signage. Companies from AT&T (network services) to VBrick (media appliances) demonstrated how these ideas of media management and wireless distribution can deliver much more compelling and useful digital signage. In applications from business to schools, offices to lobbies, these displays now can present dynamic information in multiple windows, including real-time updates, news feeds, and, of course, streaming video. And in the streaming world, the conference hosted several sessions on the promise of HTML5. In particular, Jan Ozer gave a nice update on the promise and reality of encoding and presenting video using HTML5 (the presentation is posted at his Streaming Learning Center site). HTML5 certainly has great promise -- allowing video to play directly in the browser without needing additional plug-ins, with playback across desktop to mobile, and better interactive control -- as well as simplifying the work for video producers and web developers. - First, the platforms are not quite ready, as only some 60% of the browsers by market share currently support HTML5. - Second, the browsers do not support a common video format -- The most recent versions of Apple Safari and Microsoft Internet Explorer support the H.264 standard, Google Chrome, Mozilla Firefox, and Opera support WebM (the former On2 VP8 acquired and open sourced by Google), and earlier Firefiox and Opera support Ogg Vorbis (also open source). As a result, Web developers who want to reach a broad audience still need to support Flash video in addition to HTML5, and also support multiple video codecs within HTML5. At least for the moment, the code is getting messier, rather than cleaner. There was goods news, however, from Ozer's annual update on his advice for doing H.264 encoding. It's now not so much which encoder you use, since the leading products are all quite good. And it's not so much about tweaking the encoding parameters, since you can generally get good-looking video by following general guidelines for resolution, data rate, and key encoding parameters. For example, Ozer's surveys of how leading companies do encoding for their online sites show bits per pixel at around 0.1 to 0.2 for standard-res video (640 x 360), and down to 0.05 for HD (1280 x 720) as the codecs work even more efficiently at higher res. Even better, Ozer sees Baseline profile H.264 (as required for mobile devices) now often delivering similar quality as High profile (as supported for desktop devices), which means you may be able to do most of your encoding with the single Baseline profile, and only need to encode a second version at High profile for particularly difficult video. Then for the WebM format, Ozer sees it delivering quite good quality, similar to H.264, although with more variable support among encoding tools. Ozer concluded by discussing DASH (Dynamic Adaptive Streaming over HTTP), a new standard being developed by MPEG that offers the promise of a common way to package video for true streaming directly over HTTP, from desktop to mobile, without requiring special streaming servers or clients. However, DASH is designed as an open format, not only supporting multiple codecs, but also multiple formats for dividing the video into fragments, so video that works with the approach used by Adobe and Microsoft would not work on Apple devices (including the iPhone and iPad). DASH is still being worked out, and the level of support from key companies is not yet clear, so while it also holds promise, we well may well still have another case of multiplying formats. 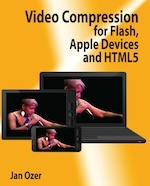 See Jan Ozer's book, Video Compression for Flash, Apple Devices and HTML5, for much more on understanding these formats and how to good video compression (see earlier post). And see his StreamingLearingCenter.com site for much more on streaming, including video tutorials, sample comparison images and videos, and information on his webinars, seminars, and consulting. Entries posted to Manifest Tech Blog in the Web-Media category, listed from oldest to newest.